Flipboard broke new ground when it launched its flashy iPad app last month that "socialized" the news by turning feeds from Facebook, Twitter, and such into a slick electronic magazine. 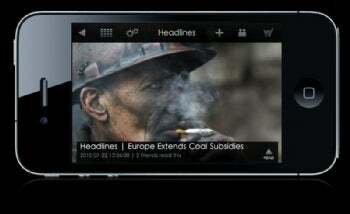 Now Blancspot Media is promising to bring the pizzazz of social news to the iPhone with its new Blancspot software. The app, now selling at Apple's App Store for $2.99, is designed to mix eye candy with interaction to create an innovative news experience for iPhone owners. "We created Blancspot to offer a news experience that is visually stunning and socially relevant, and that will engage its audience by creating a more positive way to consume and share media," Blancspot founder and CEO Camille LeBlanc says in a statement. "We are thrilled to join the efforts to make media platforms a more beautiful and elegant place to learn, share and take part in the world around us," she adds. "Blancspot provides a better news option for the digital native--we are giving them a window on the world that engages the senses and their communities." When you launch the app, a slideshow, with music, appears. Photos in the show are tied to breaking news. If you like the music behind the slideshow, you can buy it immediately from the iTunes store. By tapping a button on the screen, a news story about the photo appears. From the story, you can access Twitter or a social network created by Blancspot. You can also access from a dashboard of top stories in several news categories, such as politics, culture, and the planet. Blancspot is an engaging way to look at news on the iPhone, but it's far from the revolutionary application that its makers make it out to be.